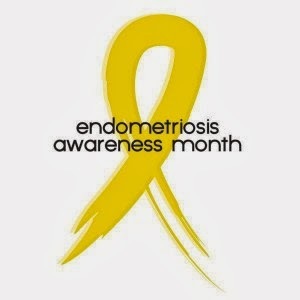 Hear ye, hear ye, March is National Endometriosis Awareness Month. This disease affects many women, often without them knowing about it so spreading awareness is crucial. Awareness should be promoted on a yearlong basis, but let’s take time now to concentrate on this issue. Endometriosis is an often painful disorder in which the endometrial tissue which grows along the lining of the uterus begins to grow outside of the uterus. Most commonly, these growths can appear on a woman’s ovaries, bowel, or tissues that line the pelvis. If you have some of these symptoms, it does not automatically mean that you have endometriosis. These symptoms can also be caused by lifestyle, diet, and exercise. However, these symptoms are often written off by the women who have them as simply being a bad period when a deeper issue may be involved. The exact cause of endometriosis is not known but there have been linkages to certain occurrences such as scar tissue on the reproductive organs. Most women suffer symptoms for almost a full 10 years before being diagnosed. As mentioned before, most women go almost a whole decade before they are diagnosed. Often because they think that they’re symptoms are normal, or that they have a particularly bad cycle. Your doctor may even tell you that your symptoms are normal. However, there are many routes that doctors can take to mediate the symptoms as these symptoms can cause lifelong pain, suffering, and damage. Finally, Be Your Own Advocate! You are in control of your own health and you influence the health of those around you. Being educated about endometriosis and its effects can make you and those around you more aware of potential health issues. Rahmatu Kassimu is a second year Ph.D student at Texas Woman's University in the Health Studies program. Her health interests include maternal and child health, minority health, and global health.